In all my years of collecting, it never occured to me why Press Pass didn’t produce baseball cards. I guess I’ve always thought of them for making college football, basketball and NASCAR stuff. 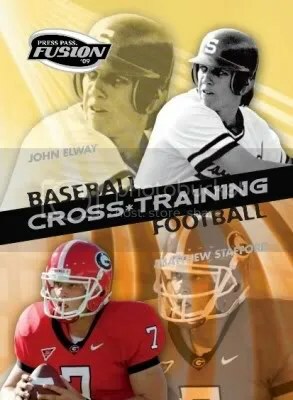 I’m sure by now you’ve heard that in November they plan to release a new Multi-Sport product called Fusion. It will cover baseball, football, basketball, NASCAR, MMA/wrestling, and the Olympics. The price is what stands out to me with this product. Each pack costs $9.99 and you’re guaranteed (2) hits inside. Usually when your guaranteed a hit or two per pack the price is a lot more. It sounds like an interesting product that I hope I can try. Even though Upper Deck received an exclusive license to produce college cards, it doesn’t go into effect until April 2010. Even after talking to my contact at Press Pass, they said Press Pass plans to produce college cards after the Upper Deck agreement goes into effect. I have a feeling some airbrushing will be going on after April 2010. Perhaps Press Pass plans to use this new $9.99 pricing strategy for other products next year. That would be a good start to compete against Upper Deck. 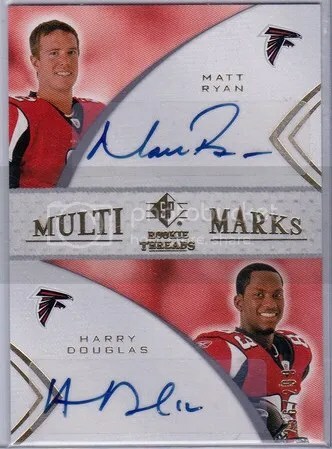 When was the last time Upper Deck made a product that guaranteed (2) hits per pack and only cost $9.99? One of the best things that card manufacturers, specifically Topps & Upper Deck, have done in recent years is include original cards within their newer products. I think its great that collectors have the chance of pulling a card from the late 1800’s and early 1900’s. Pulling old cards, gives you the chance to learn about great players that you probably never heard of. Take this card as an example. 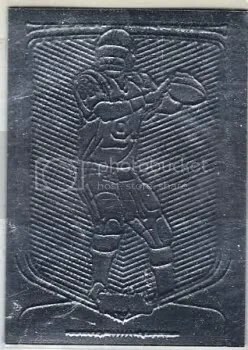 This is an original 1894 Mayo Cut Plug football card of Sam “Brinck” Thorne. He was born in 1873 and died at the age of 56 in 1930. 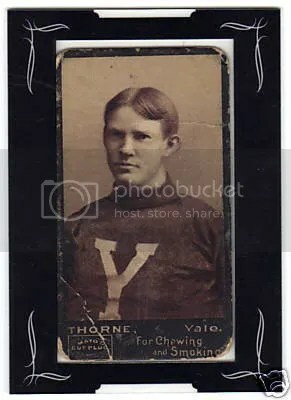 Thorne was a halfback for Yale and was inducted into the College Football Hall of Fame in 1970. The first time collectors could pull any type of vintage cards came during the 1990’s with products such as All-Sport Plus. Products like All-Sport Plus didn’t last very long because the manufacturer hyped up their product making collectors think a base card from the 1970’s was really worth a lot. You might have seen infomercials featuring Don West selling products like this. Topps and Upper Deck have done a much better job allowing collectors to pull vintage cards.